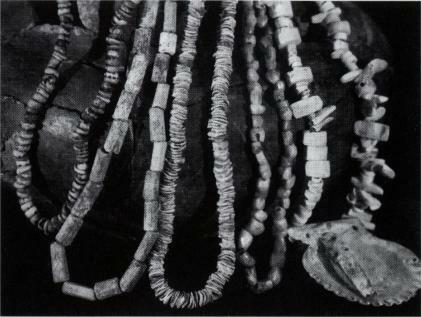 Left to right: Olivella shell, turkey bone, Pacific Coast shell, Dickson Mounds pearls and various types of shell beads. From the collection of Walter Williams. At least 15,000 years ago, the first Americans arrived and began adapting to the many environments of North America. In a couple of millennia, they had spread across the continent and increased in numbers. As populations increased, family units became tribal units that developed cultures distinct from other tribes. Anthropologists, to simplify cultural distinction of the 300 tribes, have placed them into geographical categories that range from the Woodlands (Southeastern and Northeastern) to the Northwest Coast. Although each group produced many unique items that facilitated living in their environment and specific culture, they also produced items for personal adornment. The bead was the most ubiquitous item made for adornment throughout Amerind history. Beads were made from any available material that was not too difficult to shape and drill. Pearls, teeth (including shark), bones, claws, copper, horn, ivory, broken pottery discs, and semi-precious stones and gems were all used, as well as perishable items such as acorns and goldenrod seed pods. American Indians wore beads as necklaces, anklets, and bracelets. 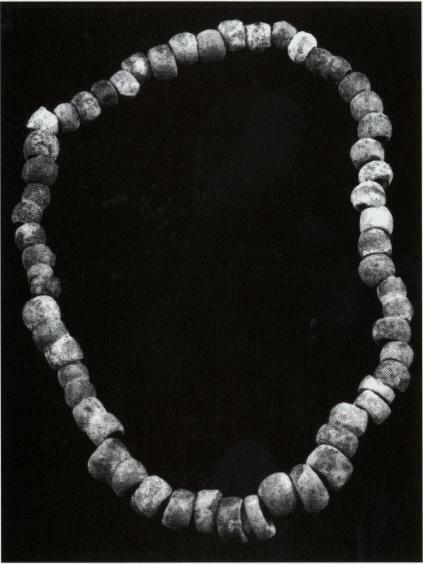 They were often worn in the hair or sewn into clothing, which was the case for many of the drilled pearls found in the Dickson Mounds in Illinois. Beads by their size, quantity, and color were a source of respect and wonder. Without doubt, the most common bead material in prehistoric cultures was shell and for a good reason. Shell was readily available in coastal areas, easy to work, and admired for its beauty and ageless appeal. Assorted Spiro Mounds beads from the collection of Walter Williams. 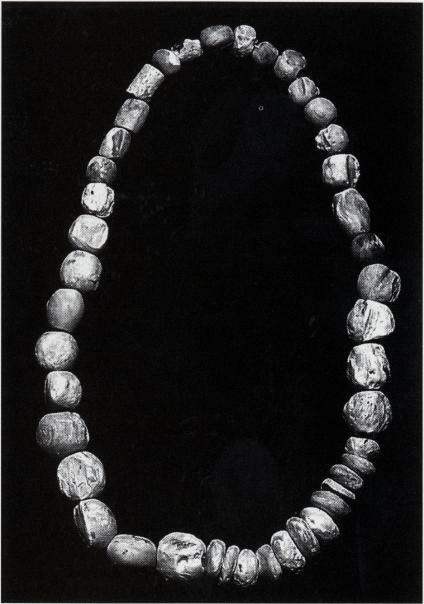 The Lindenmeier Site, known for the Paleo-era projectile points dating to 8800 BC, produced beads of bone, lignite, coal, and a partially drilled hematite bead, as well as a beautiful shell bead (Wedel, 1986:75). Additional information relevant to adornment at a very early date comes from the Reagan Site in Franklin County, Vermont. Small triangular pendants made from flat pieces of talc were found at this Paleo site. The perforations in the pendants or beads were probably made by a burin or graver in the soft talc material (Gramly, 1996:40). Life at the end of the Holocene was a serious life and death business with dangerous megafauna still abundant. Nevertheless, these early nomadic people managed to find time to make adornments that added to an individual's prestige and status in society, identified the wearer as a member of a particular tribe, definitely added personal beauty, and served a spiritual purpose. Beads denoted the wealth or achievement of the wearer. It is important to understand that Amerind people did not just value beads for beauty; they made beads an inseparable cultural component of their lives. The arrival of the Neolithic Age portended tremendous change as villages appeared along the banks of major rivers and tributaries. Successful agricultural subsistence economies allowed villages to spend more time in artistic expression. This gave rise to a need for bead material that could not be found locally. 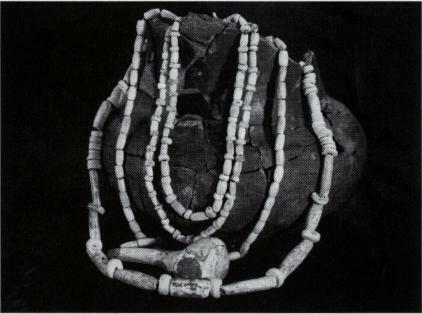 Extensive trade networks were built around the demand for lithic material and beads. Turquoise from the Pueblo cultures was traded in the West and well into Mexico. Turquoise was also found in the mounds east of the Mississippi River. When analyzed, the beads were found to have come from the ancient Cerrillos mining area in New Mexico. The spiny oyster shell (spondylus Princeps) is found on only one area off the west coast. Yet beads from this oyster were found in excavations of the Anasazi, Mogollon, and Hohokam in the Southwest and in the same Eastern mound excavations in which turquoise was found. Dentalium shells, used as a source of wealth and decoration, were produced in the Pacific Northwest but have been found at several sites in the Plains. Shells from Florida and Georgia have been found up and down the Mississippi, Missouri, and Arkansas drainage areas and were especially common during the Mississippian period (Dubin, 1987:93-94). Above: Copper beads found at the Reeves site in Lake County, Kentucky. Amazingly, copper beads from the Lake Superior or southern Appalachian region were found at the Spiro Mounds Complex (McDannald Collection, 1976:13). Perhaps even more amazing is the story Cabeza De Vaca recounted upon his return to civilization: "The inmates of these abodes came to receive us halfways, with their children on their backs. They gave us a number of pouches with silver and powdered antimony (or lead) with which they paint their faces, and many beads and robes of cow-skins, and loaded those who came to us with all their chattels" (Cabeza De Vaca, www.pbs.org). The fact that precious beads were given as a gift is not unique. It happened on several occasions according to Cabeza De Vaca's journal. What is remarkable is this statement: "...There, among other things which they gave us, Andres Dorantes got a big rattle of copper, large, on which was represented a face, and which they held in great esteem. They said it had been obtained from some of their neighbors. Upon asking these whence it had come, they claimed to have brought it from the north, where there was much of it and highly prized" (Cabeza De Vaca, www.pbs.org). Even among these Indians, probably Jumanos, who lived just above the subsistence level, a trade system had developed that was sufficient to bring copper from the Great Lakes region to the villages around what would become El Paso, Texas, a distance of approximately two thousand miles. 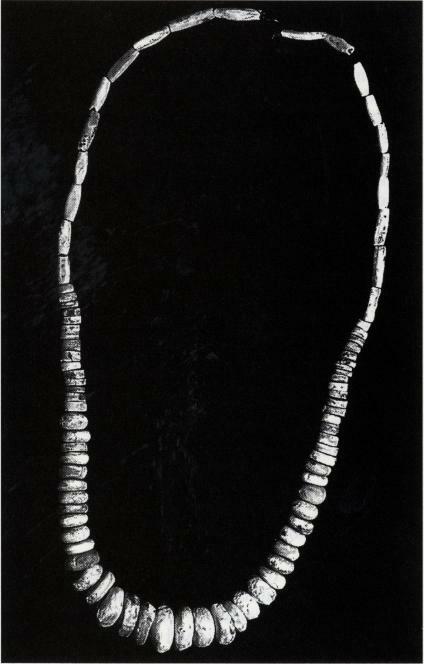 Above: Teeth and whelk shell necklace found in Hamblen County, Tennessee. Bruce Whitney collection. The Poverty Point Culture, famous for the numerous small, baked clay balls used for food preparation, also developed great skill in lapidary work as early as 1800 BC. They acquired red jasper, amethyst, feldspar, galena, and limonite by following the forest pathways and traveling the numerous rivers and tributaries in their dugout canoes. Contacts were made with other societies in the Eastern and Midwestern United States to procure the needed material for the ornament as well as the material for shaping and drilling the flint or stone (Pope, 1986:108-115). For instance, steatite came from the Appalachian region, and cherts came from the north. These Late Archaic people developed a tradition of working stone, a difficult material to drill or shape when compared to the shell their contemporaries used. Many types of tools used to work the ornamental beads have been found at the site, including chisels, drill points, perforators, and more than 30,000 micro flint tools, some just barely over an inch long. Poverty Point was an agricultural community blessed with seasonal flooding of their fields. In addition, this was an area where nature bountifully blessed the inhabitants with fish, fowl, and game as well as wild seeds, fruits, and roots. It is very possible these people traded their agricultural surplus for the precious stones they needed to make exquisite beads, buttons, and pendants. The Neolithic revolution not only brought about changes in agriculture and the domestication of animals, but also eventually led to the invention of three types of bows designed for a specific purpose: the fire bow, the bow drill, and the hunting bow. Abundant speculation exists as to which came first. Almost certainly, it was not the hunting bow; nevertheless, all three profoundly affected the way these early Americans lived and related to others. 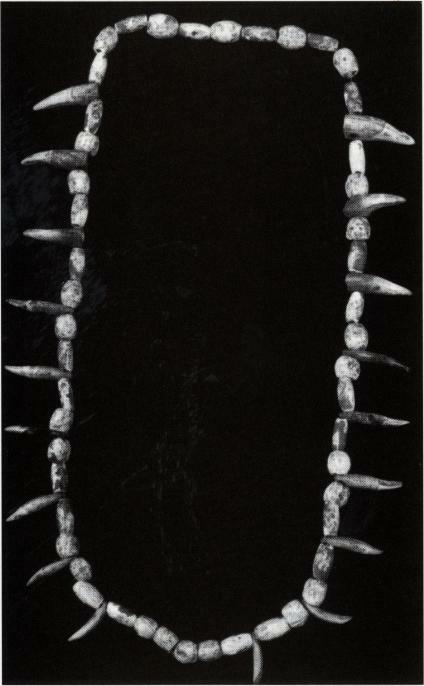 Above and Below: Two bead necklaces from the Spiro Mounds site in Oklahoma. Photo courtesy of the Gilchrist Museum. The fire bow consisted of a shaft with a prepared block of wood with a slight concavity in the base and a small bow with sinew string. A coordinated hand movement mixed with a tuft of dried grass could quickly start a fire. The author remembers an old timer talking about finding a child's bow in a rock shelter on the Pecos River shortly after the Great Depression. It is very probable that what he actually found was a fire bow. Another invention was the bow drill. Very similar to the fire bow, a wooden shaft was used with a pressure block with a concave depression in it for securing the upper rounded end of the drill shaft. The bowstring was looped around the drill shaft with the bit positioned at the drilling loca*tion. Pressure applied by the wooden block, as the drill was drawn forward and backward determined the speed with which the hole was drilled. In experiments by Leland Patterson, wet sand used as an abrasive had to be replaced every few strokes of the drill (Patterson: 10-13). The abrasive allowed the driller to use relatively soft material, perhaps a porcupine quill or a cactus spine to drill through hardened material such as pearls and columella shells. Jamey Allen, an avid collector and researcher, noted, "A drill can be made from any hard material and will be reasonably effective if used properly. It is the slurry (the combination of ground up stone being abraded from the thing being drilled) along with water that is a coolant and medium--all this combining inside the budding perforation that does the real work, more so than the hardness of the drill or bit" (Allen, Sept. 2002). However, not all beads had to be drilled. At the Nightfire Island Site, Carol Howe discovered a string of notched calcite beads. Calcite in its crystalline form is soft and easily notched. Easily secured with a strand of woven grass or stripped bark by the Modocs, the result was a hastily made, yet durable necklace whose very color and translu*cency made it appear to be charged with supernatural power (Howe, 1979:220). Furthermore, the common use of the bow drill does not absolutely indicate that it was adopted throughout North America. When John Lawson described his visit to the Occaneechi camp, he explained that the Indians ground the preform bead on "stones and other things till they make it current" (Lawson, 1967:204). But the actual drilling took place with a nail stuck in a cane or reed. The Indian then rolled the cane with one hand and moved the bead with the other until a hole was drilled through. American Indians in the Northeastern United States used the white shell from the inner whorl of columella of the whelk in conjunction with purple from the quahog shell to make wampum. The small cylindrical beads were drilled through the center and strung in a variety of ways and used as clothing and body decorations. American Indians used wampum during ceremonies of dance, healing, and religious rituals. Wedding agreements and peace treaties were often made binding by the exchange of wampum. The white beads represented promise and peace. Because the purple beads represented sadness or death, they became valuable for political purposes (Dubin, 1987:169-171). After European contact and due to the scarcity of coins, early colonists used wampum as a source of money. While this definitely affected the native population, the strictly commercial use of wampum was primarily limited to dealings with the colonist. In time, wampum evolved to become a sacred symbol among American Indians. American Indians possessed a tremendous appreciation for nature. Using natural objects for personal adornment only accentuated and honored this cherished environmental tradition. Today, by studying the beads from numerous places like Spiro Mounds, Dickson Mounds, and Poverty Point, the observer gains an abiding respect not only for the intrinsic beauty of the bead, but also for the maker who found the time to locate the material and shape it into a form that was both pleasant and meaningful. It served as an expression of creativity at that moment as well as hope for the future.